Fundamentals of Building Construction 6 Edition Note from the publisher: The Interactive Resource Center is an online learning environment where instructors and students can access the tools they need to make efficient use of their time, while reinforcing and assessing their understanding of key concepts for successful understanding of the course. An access card with redemption code is included with all new, print copies or can be purchased separately. (***If you rent or purchase a used book with an access code, the access code may have been redeemed previously and you may have to purchase a new access code -ISBN: 9781118820223). The online Interactive Resource Center contains resources tied to the book, such as: 45 Interactive Exercises including all required objects, as well as a video tutorial on the basics of SketchUp and how to complete exercises tied to key concepts Interactive Animations revealing complex construction processes Image gallery including 75 full color photorealistic renderings Flashcards and Self-Tests by chapter for reinforcing key terms and concepts Supplementary Photo Gallery demonstrating construction operations Now in its sixth edition, this bestselling reference focuses on the basic materials and methods used in building construction. 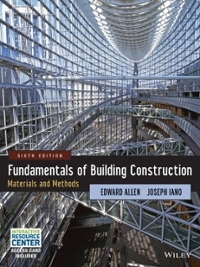 Emphasizing common construction systems such as light wood frame, masonry bearing wall, steel frame, and reinforced concrete construction, the new edition includes new information on building materials properties; the latest on "pre-engineered" building components and sustainability issues; and reflects the latest building codes and standards. It also features an expanded series of case studies along with more axonometric detail drawings and revised photographs for a thoroughly illustrated approach.